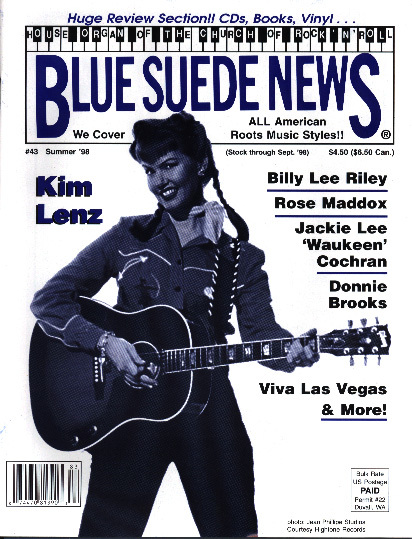 Blue Suede News #43: Kim Lenz, Billy Lee Riley, Jackie Lee Cochran, Donnie Brooks, Rose Maddox, Viva Las Vegas, Rockabilly '50s Rock'n'Roll! Issue #43 - Summer 1998 - Scroll down to order!! Blue Suede News #43 (Summer 1998) has 68 pages and a slick cover. The title story features Kim Lenz, a very dynamic, strong and stylish, sassy and sweet Rockabilly singer. Great story on her. There are two more stories on extraordinaire Rockabilly singers, Billy Lee Riley and Jackie Lee Cochran. Riley almost had a hit with Flying Saucers Rock'n'Roll before Sam Phillips pulled the plug on his SUN-single and promoted Jerry Lee Lewis instead. The rest is history. But Billy Lee deserves just as much recognition as Jerry Lee and here you can read his story! Jackie Lee Cochran also started out as a Rockabilly singer in the '50s and had some great songs out, in the 70s Ronny Weiser re-discovered him and he recorded for Rollin' Rock Records. He also appeared in "Let's Make Love" with Marilyn Monroe. Also in this issue is a story about Donnie Brooks who had several hits in the early '60s (Mission Bells among others) but he also recorded Rockabilly under several pseudonyms in the fifties. There is an overview of Rose Maddox career, she was the star of the very colorful Hillbilly band The Maddox Brothers and Rose and one of the first female Country stars, also recording duets with Buck Owens in the '60s. The Viva Las Vegas Rockabilly weekender is featured with an extensive review and lots of cool photos (Don & Dewey, Mack Stevens, Collins Kids, Treniers, Go Getters, Big Joe Louis, Deke Dickerson, Racketeers, Ronnie Dawson, Hot Stuff, Big Boy Bloater, Tennessee Rhythm Riders and more) and there is a fantastic photo spread of the New Orleans Jazz and Heritage Festival with photos by renown Blues photographer Jef Jaisun (Keb' Mo, Bonnie Raitt, Eddie Bo, John Mooney, Frankie Ford, Jimmy Vaughan, Ruth Brown, Terrance Simien). Very interesting issue.